In India, travel is generally associated with those by road and rail. When we think of road transport, we think of buses and private vehicles. For shorter distances, such as up to a 1000 kilometres, this is perfectly fine. For longer distances, travelling by car or bus is impractical, as it might be split over several days, and continuously having to drive is difficult. For such distances, trains are often the go-to. Trains travel the entire breadth and length of India, from Kanyakumari in the southernmost end, all the way to Srinagar in the north. They are quite comfortable for travelling long distances, owing to the fact that there are no jerks and lateral movement as is the case with cars and buses. The fastest, and perhaps the best mode of transport, is still air travel. Although associated with higher costs and a sense of luxury, air travel is the best way to go from one part of the country to another. Here are some reasons why. Safety: Regardless of all the horrifying crashed you see, air travel is statistically the safest way to travel. Train and road transport have a higher chance of accidents. This has repeatedly been proven. So unlike general consensus, air travel is surprisingly safe. Costs: Although flights are still one of the more expensive ways to travel, the rise of budget airlines in the past few years has seen an incredible increase in the number of passengers. IF tickets are booked nearly 6 months in advance, they are on part with some of the more expensive classes of trains and buses. This is astonishing, especially considering the fact that you will reach your destination in barely 1/4 or 1/5 of the time taken by road or rail. Speed: Flying is the best choice for anyone having less time. For example, to travel from New Delhi to Goa, almost 34 hours of travel time is needed by car. This can take up to 3 days to drive. 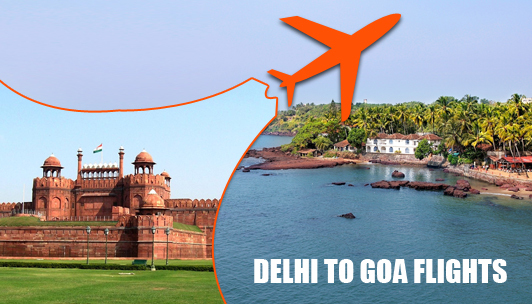 By air, on checking the various New Delhi to Goa Flights Schedule, you will see that it will take barely 2.5 hours. The difference in time is unquestionable. In-flight entertainment: Equipped with some of the best entertainment systems, flights are without a doubt the best experience for a traveller. A vast array of movies, television shows, music are available at your fingertips, ensuring that you don’t feel bored for even a minute. Stunning views: While travelling by train can treat you to some beautiful sights of India, air travel beats everything by a mile. A bird’s eye view of cities, forests, farmlands, lakes and oceans will take your breath away! AS you soar through the clouds, the beauty of Earth is spectacular to witness. Productivity: An aeroplane is a perfect environment to get to work. You can efficiently work on your laptop without any disturbance. The cosy atmosphere could even cause you to take a much-needed nap, allowing you to work better the rest of the day. Clearly, air travel is the best way to go from one place to another. Although it is more expensive, the numerous advantages can make up for the extra cost.